Student Activities is hosting its Spring Fest event April 9 to 11. The event will kick off with speaker Stan Pearson at 2 p.m. April 9 in the H.B. Atkinson Theatre. Pearson is a di-versity and motivational speaker whose method S.A.L.S.A., or support, act, learn, strive and accept, engages audiences in interactive activities on topics such as stereotypes, self-esteem and leadership. The event will have free pizza. Last year’s Spring Fest ended up indoors due to rain. Event planners hope to see outdoor activities this year. On April 10, the Community Health Fair will be held from 10 a.m. to 2 p.m. in the Student Center and Wellness Center, in conjunction with Spring Fest. Free screenings for blood pressure, sleep apnea, diabetes and a posture analysis will be offered, as well as cholesterol testing from 9 a.m.-12 p.m. The cholesterol screening requires participants to fast after midnight. Free Jersey Mike’s will be available, as well as music from Nicnos, a Moore based band. April 11 will feature the band North Meets South, another Oklahoma based band, and free pizza in the campus mall. A self-defense class is also being held in the Wellness Center at 2 p.m. free of charge. 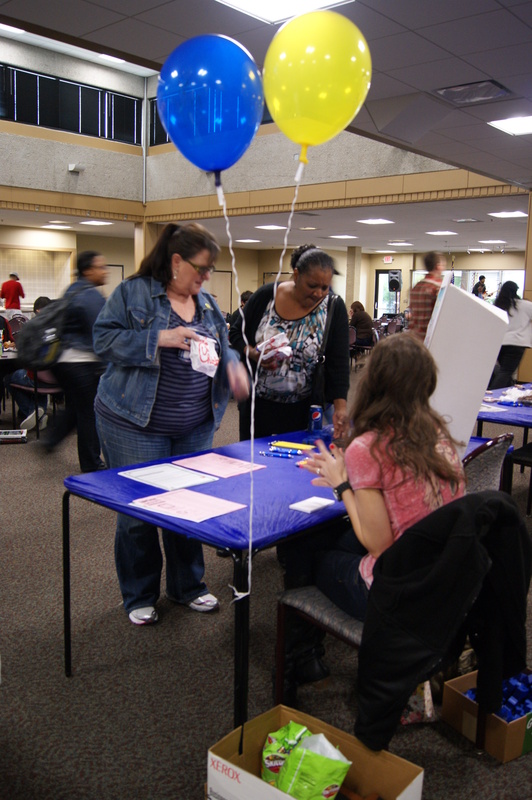 Clubs who would like to set up a table during Spring Fest need to contact Student Activities at 733-7376. On April 10 and 11, Senate Executive officer elections will be held online on D2L. Student Success and the Welcome Center are hosting their “Spring into Campus” event again this year from 9 a.m. to 4 p.m. April 10 and 11. This event will allow students to meet with an advisor and get enrolled in summer and fall classes. Free snacks will be provided. To RSVP a spot, call the Welcome Center at 733-7372. 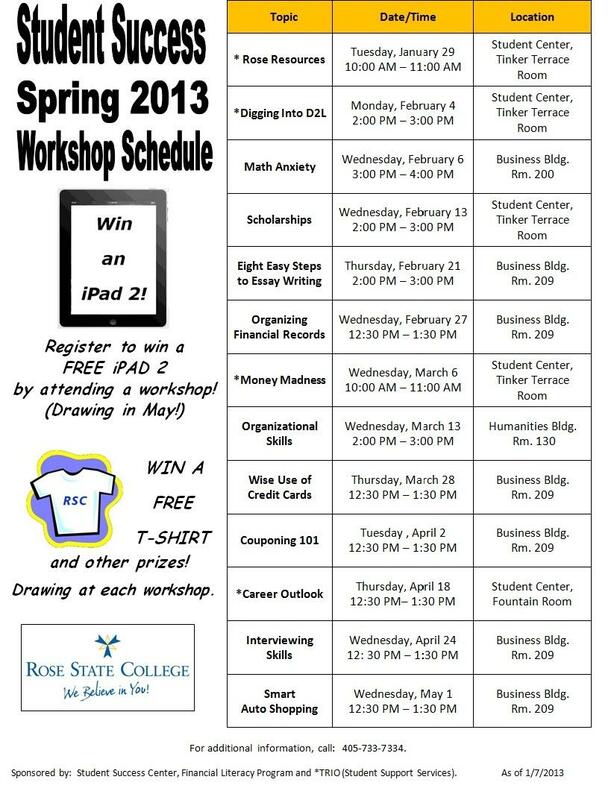 The Student Success Center has two upcoming Financial Literacy Program workshops. The “Wise Use of Credit Cards” workshop will be held March 28 from 12:30 – 1:30 pm and will discuss how to use credit responsibly. The “Couponing 101” workshop is April 2 from 12:30 – 1:30 pm and will teach novice spendthrifts the ins and outs of coupon mastery. This is one of the most popular Student Success events, so get there early. Both workshops will be held in the Business Building, room 209. All attendees will be entered into the drawing for a free t-shirt. They can also register for the Apple iPad drawing that will take place in May. The Student Success Center and its workshops are part of the Achieving the Dream Initiative, which focuses on student retention and success rates through various programs. Spring enrollment starts Nov. 7 and students might want to pick up the Spring 2012 schedule to help them decide which classes they want to take next semester. One thing students should keep in mind is that online classes and general education classes fill up fast; students should enroll in those classes as soon as possible. Students can either enroll online, through Oasis or meet with an academic adviser that will help with enrollment. There are pros and cons to both forms of enrollment. It really depends on personal preference; students should be aware that if they choose to see an adviser it is very helpful to be prepared by bring in a list of classes that have already been taken, their chosen major, and how many credits they are likely to take. Another tip is that once the course schedule for next semester is done, take it to the Rose State bookstore in the Student Center and ask them if they know which books are required for each class and, if known, when they will become available. In order to beat the book buying rush, make sure to keep track of the days books become available or when they can be bought. Keep these tips in mind when enrolling, and remember that even though fall semester might just be ending, spring enrollment is right around the corner.